DSR news Archives | TOMMY JOHNSON, Jr. Following a runner-up finish in Las Vegas last Sunday, Tommy Johnson Jr. felt like his Make-A-Wish Dodge Charger SRT Hellcat Funny Car was on the verge of breaking through this weekend in Houston. After a pair of “misses” in Friday’s opening qualifying rounds, the team dialed-in their MOPAR-powered Hellcat and made a pair of consistent runs despite changing weather conditions. The Iowa driver ended up 11th on Sunday’s elimination ladder and faced teammate Matt Hagan in the first round. Johnson had a slight starting line advantage, but lost traction shortly thereafter allowing Hagan to drive away for the victory. Johnson’s run of 4.807 seconds resulted in his first first-round loss of 2019. Tommy Johnson Jr. raced to a runner-up finish on Sunday at his 450th professional event. 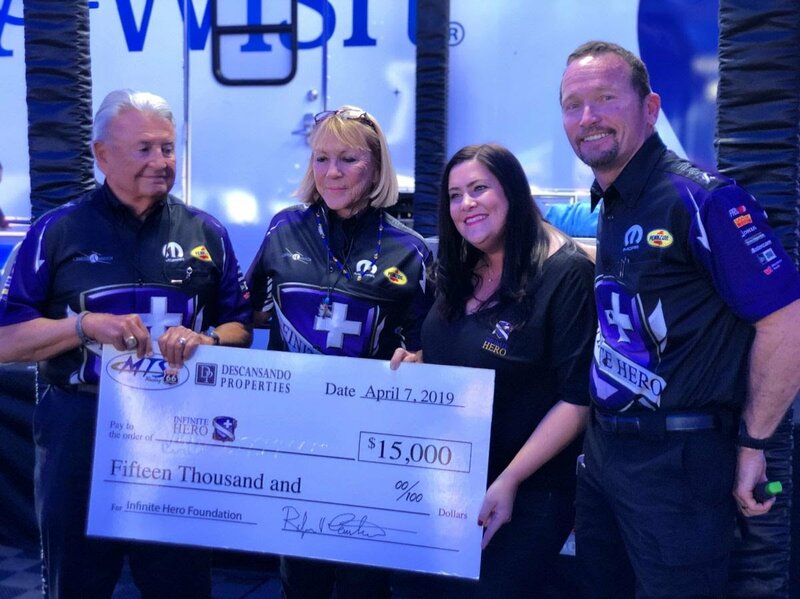 For the second year in a row, Johnson and the John Collins-led Make-A-Wish Foundation Funny Car team raced for the Vegas Four-Wide Nationals Wally trophy by advancing to the final eliminations quad. After registering a winning E.T. in round one, Johnson faced tough competition in his round two matchup. The stacked quad featured Jack Beckman and Ron Capps behind the wheel of their DSR Dodges, and Funny Car juggernaut John Force. Johnson was quick off the starting line clocking the best reaction time of the group, and powered his Hellcat to the quickest lap of the round, lighting up the scoreboard with a 3.994 E.T. The final eliminations quad pitted Johnson against fellow ‘giving car’ pilot Jack Beckman, reigning world champion J.R. Todd, and No. 1 qualifier Tim Wilkerson. Johnson laid down another solid pass and maintained pace with Todd until just before the finish line when Todd pulled ahead and captured the win. Johnson’s performance was recorded as a runner-up finish and the two-time LVMS winner jumped up to third in the Funny Car rankings.